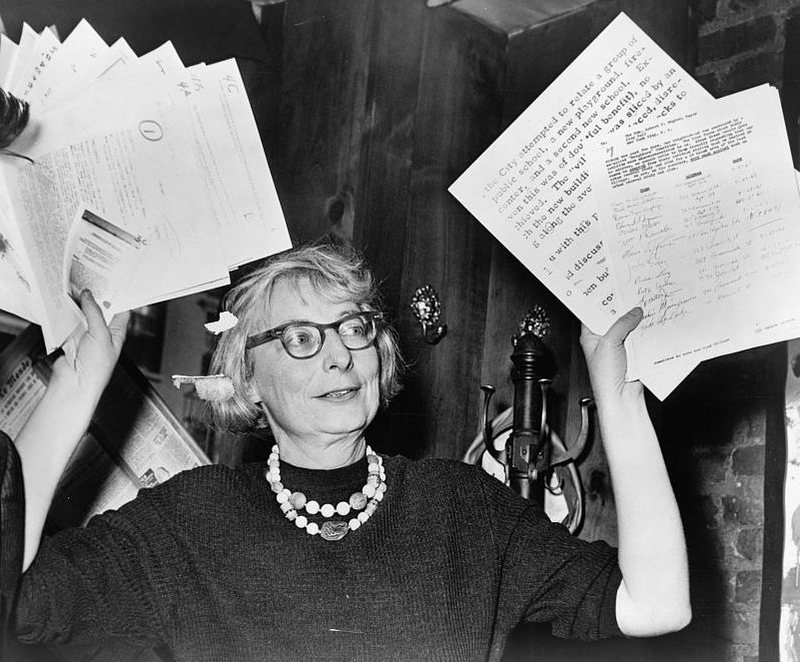 For fans of the writer and urbanist Jane Jacobs, who died in 2006, May 4 has long had special significance because it was her birthday. This year it will be bigger than usual because May 4, 2016 is a milestone—the 100th anniversary of Jacobs’s birth in Scranton, Pa.
Architects and urban planners on at least four continents are organizing a series of talks, walks, and other events to celebrate Jacobs’s life and impact on the built environment, starting this spring and continuing through the year. In addition to Jane Jacobs Day and Jane Jacobs Walks, there will be a Jane Jacobs Centennial Lecture Series (mostly in New York but as far away as Japan and India); a two-day symposium at the Delft University of Technology in the Netherlands; a Jane Jacobs Fellowship Program and a Jane Jacobs Medal ceremony. There is currently an exhibit in Toronto on Jacobs’s life called Jane at Home (featuring items from Jacobs’s own estate, and curated by her son Jim); a new staging of the Jane Jacobs (and Robert Moses) opera, A Marvelous Order; themed food truck menu items called Jane Jacobs Specials, and even a Jane Jacobs Girl Scout merit badge (started by a troupe in Salt Lake City). 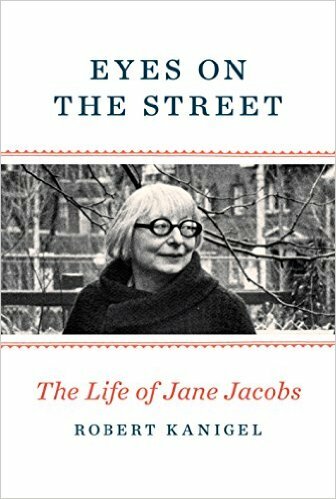 In the literary world, Jacobs will be the subject of a new book, Robert Kanigel’s Eyes on the Street: The Life of Jane Jacobs, to be published by Knopf this fall. Kanigel’s book follows Peter Laurence’s Becoming Jane Jacobs, released last year. A group of writers is working with The Whole Earth Catalog creator Stewart Brand to publish a Whole Jane Catalog. Another publisher is reportedly working on a book that would contain a collection of her shorter articles. There are several websites created to keeping Jacobs’s memory alive. They include the centerforthelivingcity.org and two sites that keep track of Jacobs-themed walking tours, janeswalk.org and janejacobswalk.org. Jacobs-themed walks in New York are coordinated by the Municipal Art Society at Janes Walk NYC @ MAS.org. Philadelphia has a vibrant program, organized by PlanPhilly and listed on Facebook under janeswalkphilly. All of this activity is in tribute to the woman who wrote The Death and Life of Great American Cities, first published in 1961 and considered one of the most influential books on urban planning written in the 20th century. Its reputation is all the more remarkable because its author had no formal training in urban planning or design. One of the biggest tributes is the yearlong Jane Jacobs Centennial Lecture Series. Coordinated by the Center for the Living City, it starts on May 4 and has more than a dozen speakers. Most lectures are taking place at the Museum on Eldridge Street at 12 Eldridge Street, between Canal and Division in lower Manhattan, but some will be elsewhere. The New York talks start at 6:30 p.m. In New York, the talks are free, but people can make a donation if they want. As of late April, the New York lineup of speakers includes broadcast journalist and writer Ray Suarez, May 4; Central Park Conservancy founder, landscape designer and Jane Jacobs Medal recipient Elizabeth Barlow Rogers, June 15; economist Sandy Ikeda, psychiatrist Mindy Fullilove Thompson and architect Ron Shiffman, July 13. Also, architecture critic Paul Goldberger, September 14; writer Adam Gopnik, September 28; Jacobs biographers Robert Kanigel and Peter Laurence, Oct. 6; Ford Foundation president Darren Walker, November 9; former New York City transportation commissioner and Jane Jacobs Medal recipient Janette Sadik-Khan, November 16; Deutsche Bank Americas Foundation president Gary Hattem, November 30; sociologist Saskia Sassen and sociologist Richard Sennett, December 7. Roberta Brandes Gratz, urban critic, author and president of the Center for the Living City, will give a Jacobs lecture in Tokyo, Japan, on July 30. Goldsmith will give a Jacobs lecture in Hyderabad, India in July. Jaime Lerner, an architect, former mayor of Curitiba, Brazil, and leader in urban acupuncture, will give a Jacobs lecture in Salt Lake City in September. Other speakers, dates to be determined, include New York Times architecture critic Michael Kimmelman; New Orleanian writer Lolis Eric Elie; New Orleans radio program host Gwen Tompkins; Brazilian urban planner Roberto Rocco; African community activists Rahul Srivastava and Matias Echanovea; New Orleans architect Steven Bingler; architect and critic Michael Sorkin, and historian Richard Rabinowitz. 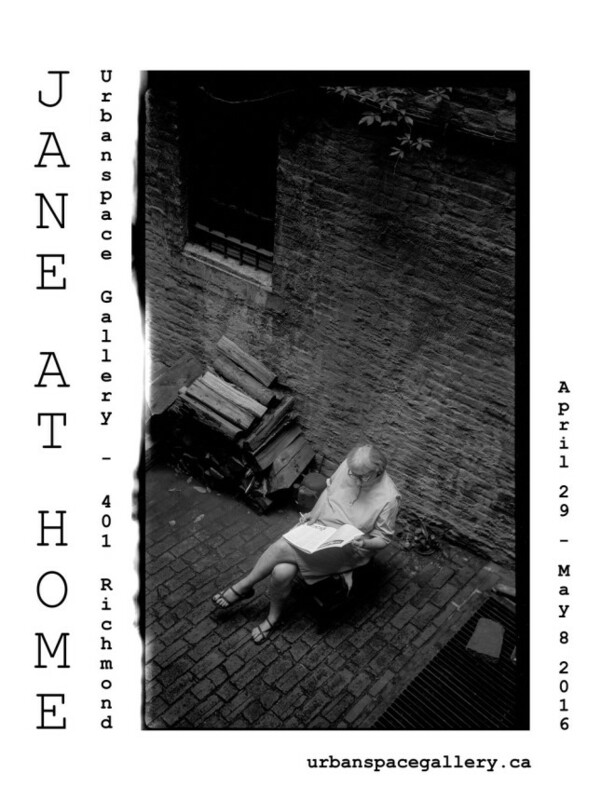 The Jane at Home exhibit, featuring personal items from Jacobs’s estate, is on display now and runs through May 8 at Urbanspace Gallery, 401 Richmond Street West in Toronto, Canada. It was curated by Jacobs’s son, Jim. A two day symposium entitled “Jane Jacobs 100 – Her Legacy and Relevance in the 21st Century,” will be held at the Delft University of Technology in the Netherlands on May 24 and 25. The organizer is educator and urban planner Roberto Rocco. There are hundreds of Jane’s Walks throughout the year. All have different themes and different objectives. 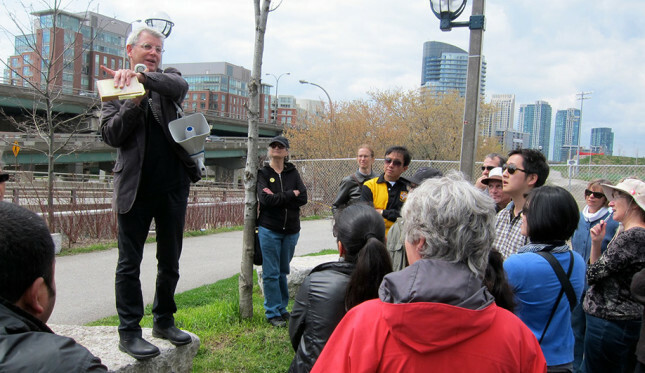 There are preservation-oriented walks, waterfront walks, horticultural walks. According to Goldsmith, individuals or groups can decide where they want to walk and what they want to talk about, post it on one of the website calendars, and take it from there. What would Jacobs think about all this?